Violence against women doesn’t just include physical acts, but also includes sexual, emotional, psychological and financial abuse. For example, the current storyline in The Archers has slowly revealed Helen’s new husband, Rob, to be someone who has started manipulating his wife’s life and socially isolating her. In order to take control of their lives back, some local survivors of domestic abuse have taken the initiative to set up a series of creative therapy workshops for women of any age, race, ethnicity or sexuality who identify as having been abused. 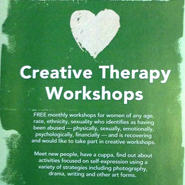 These Creative Therapy Workshops are free and are self-referred. Any woman who is interested in taking part is invited to first come along to the drop‐in Introductory Morning on Friday 4 March. The workshops will be co-facilitated by two trained teachers and will take place as a closed group on a monthly basis, starting in mid-March, in a safe and supportive environment. If you are interested in the workshops and want to find out more, why not drop-in to the Introductory Morning on Friday 4 March from 11.30am to 1pm at the Pinehurst Centre for a chat, a cuppa, and to meet the facilitators? The focus of the workshops is on self-expression using a variety of strategies including photography, drama, writing and other art forms. The workshops will engage with a person-centred approach and are underpinned by a belief that using a dynamic and flexible creative model, developed with the input of the participants, can enhance and support a person’s well being and mental health. A further aim of this group is to support women through harnessing creativity and allowing for mutual support networks to evolve in a confidential, friendly, safe and supportive environment. Note: These workshops are not for women who are in the midst of a difficult or dangerous abusive situation. Want to join in but cannot make the Introductory Morning? If you cannot make this session but are interested in taking part in the workshops and want to find out more, please contact us by email for an informal discussion: refugeworkshops@gmail.com. To find out more about domestic violence, and to donate to a local cause, visit the Penny Beale Memorial Fund website.